Before the era of ninja villages, Madara was considered one of the most gifted members of the Uchiha clan alongside his younger brother Izuna Uchiha. Even by his clan’s standards, Madara’s chakra was especially strong. 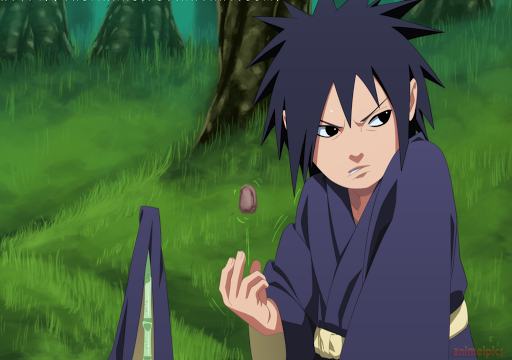 As a child, Madara met Hashirama Senju for the first time and became rivals at skipping stones. As they grew older, Madara’s rivalry with Hashirama became increasingly intense. Madara also competed with Izuna during training prior to awakening their Mangekyo Sharingan. In the era of Madara’s childhood, as well as before his corruption Madara was a kind, temperamental and highly competitive child wanting to perfect everything he did. Despite this he was highly sensitive and apologetic, as revealed when he comically stated that he was not able to urinate with others standing behind him, and when he tried to comfort Hashirama when he thought he hurt his feelings. Madara was also angry outbursts when he got annoyed, when Hashirama would tease him about not being able to skip a rock to the other shore of a river when they were boys. Due to the harsh nature of the times they lived in, Madara believed that the only way to survive in the Shinobi world was to make allies with your enemies, an ideal shared by his rival, whom eventually became his close friend and ally. 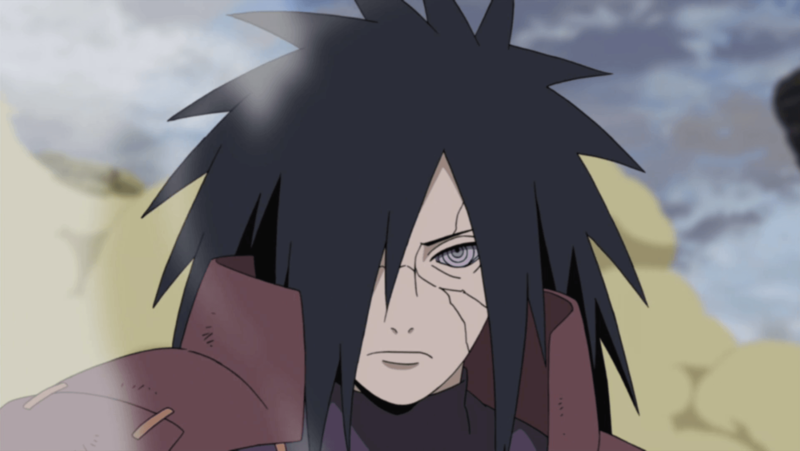 However, after Izuna’s death Madara’s personality changed drastically. Uchiha Madara was the legendary ninja who led the Uchiha Clan and after the formation of Konohagakure. After allying with his rival, Hashirama Senju and the Senju clan, he and his clan helped in the founding of Konoha. After being reincarnated by Kabuto Yakushi during the Fourth Shinobi World War, he becomes one of the major antagonists in the series. Before the ear of the ninja villages Uchiha Madara and Izuna Uchiha were considered most powerful ninja in their Uchiha clan and Madara was much stronger than other because of his chakra was especially strong. Madara grew up training with his brother Izuna and their efforts to surpass each other. 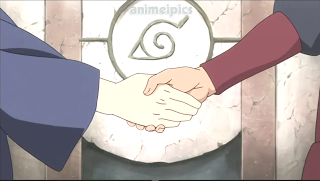 After killing the one who closest to them and they both obtained the Mangekyo Sharingan. Uchiha Madara and his younger brother Izuna Uchia was the first who awakened Mangekyo Sharingan and this was a feat no member of the Uchiha clan had never accomplished before. With the power of their eyes they took control over the Uchiha clan and the elder brother, Madara, became the clan’s leader. After continuously battle Madara eventually began to suffer from overuse of the Mangekyo Sharingan(Upgrade of Sharingan), leaving him blind. 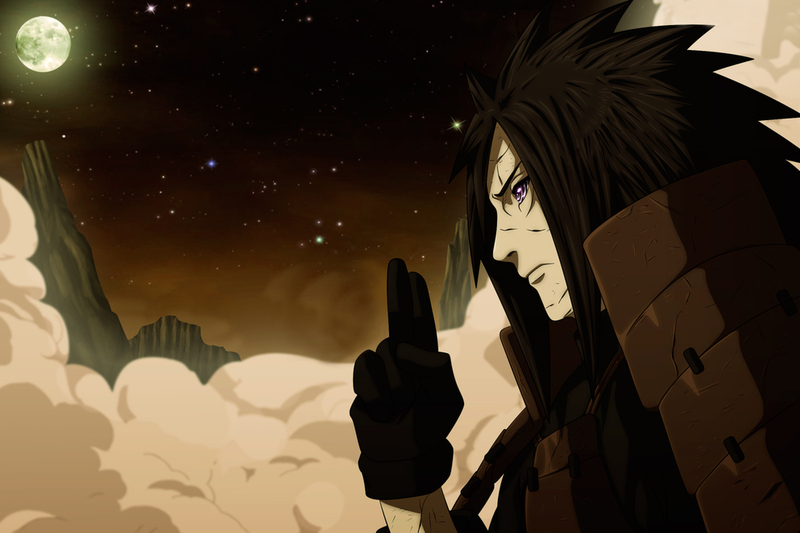 Madara did everything he could to free himself from the darkness, but all hi efforts ere in vain. He fell into despair and finally, after being possessed by his eyes, he reached out to a new light. 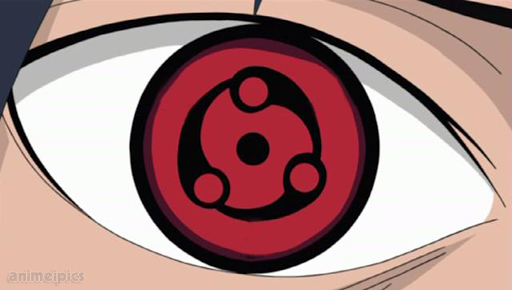 In order to regain his sight he took his younger brother Izuna’s eyes for himself, granting him an “eternal” Mangekyo Sharingan (Third upgrade of Sharingan), Madara gained a new source of light, yet, this time, his light would never fade again. By exchanging hosts, the younger brother’s eyes found a new eternal source of light and he gained completely new eye technique. While Itachi claimed that Madara took Izuna’s (Madara’s Younger Brother) eyes without his consent, Tobi, while retelling this event to Sasuke, stated that Izuna willingly gave up his eyes to Madara for the good of his brother and clan.It is unknown which is true. 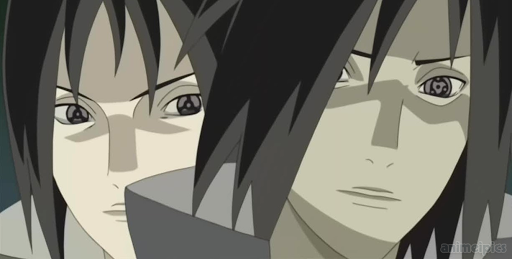 Over the years, the Uchiha had constantly fought with the equally powerful Senju clan and as such, Madara had an undying rivalry with Hashirama Senju, Once they start an endless fight and tired and Senju Hashirama asked for a truce with the Uchiha and the Uchiha agreed.Allied with Madara Uchiha and his clan, the two groups Senju Clan and Uchiha Clan founded Konohagakure. 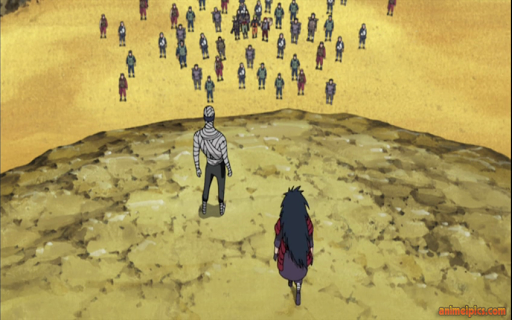 After some times when Madara began to fear that Hashirama would begin to oppress the Uchiha and tried to rally support for challenging his leadership, rather than help him, however, the Uchiha turned their backs on Madara Uchiha clan’s member decided to live peacefully in Konohagakure the Madara left the village. After some times Uchiha Madara returned and challenged the Hasirama Senju. Uchiha Madara was fully prepared for battle and they fought very bravely in that fight Madara summoned Kurama (Nine Tails), Hashirama Senju fought alone both of them and Madara was defeated and he was believed to have died. No one knows about Madara had survived and he used Hashirama’s DNA, which he had acquired on the battlefield, and transplanted it into his wounds. Madara activated his Rinnegan when he was nearing to the death. He also acquired the Wood Style kekkei genkai and with both Senju and Uchiha DNA the ability to summon the Demonic Statue of the Outer Path.He later transplanted his Rinnegan eyes into Nagato without the young man knowing. Obito was saved by Madara during the Third Ninja World War, after the battle of the Kanabi Bridge, using artificial mass to replace the destroyed half of Obito’s body. He told Obito that he would have to repay his debt to him slowly. Obito was completely twisted by Madara even he was still sincere with his village Konoha and his friends. Madara teach him various Uchiha Kinjutsu, those of the Rinnegan and Yin-Yang Style. 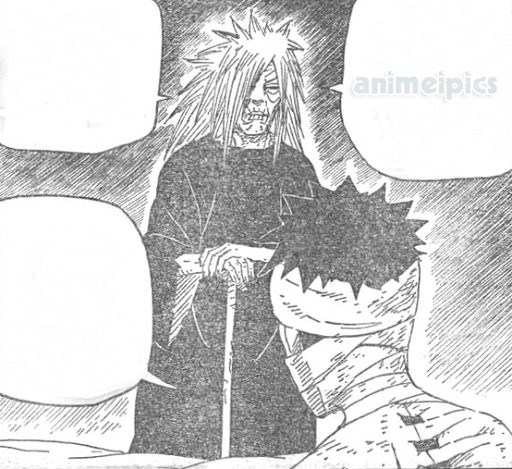 Then Madara left White Zetsu to guarding Obito and helping with him his rehabilitation. Before passing, Madara also created Black Zetsu by pouring his will into White Zetsu and also left part of his will in the chakra receiver which extends from the statue’s navel. With that, Madara disconnected himself from the statue and, with his dying breath, told Obito to go and, until the time he was revived, he was to act under his name. Madara is a master in Fire Release nature transformation, displayed in his use of devastating fire techniques such as the Fire Style Great Fire Annihilation technique which required the combination of numerous Water Style Water Encampment Walls to extinguish, and the Fire Release: Great Fire Destruction technique which he used to incinerate a large portion of the forest he had created. Madara also can create Dragon Shaped Ball with fire. 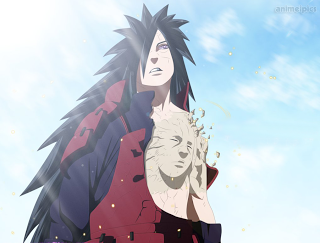 After fighting with Hashirama Senju at the valley of The End, Madara acquired a portion of his DNA which after a long period of adaptation, granted him the Wood Release nature transformation. 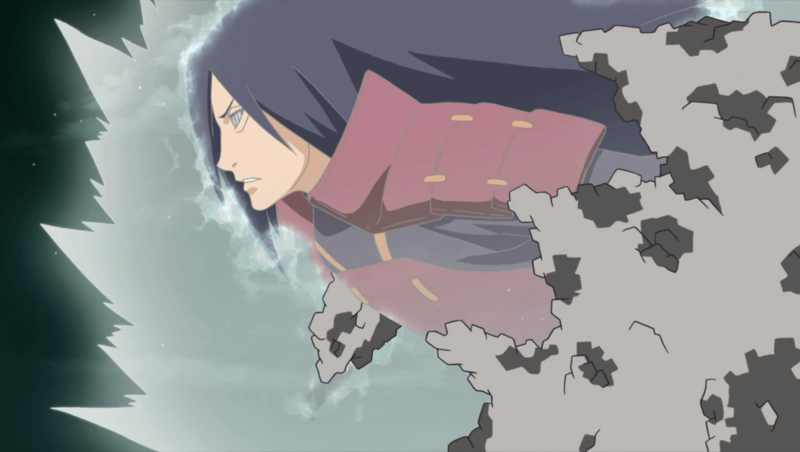 With his Wood Release ability Madara can create numerous massive trees with which to attack his opponents directly, and a dense forest of flowering trees, whose pollen can render a foe unconscious. Madara can merge himself within trees and he also capable of creating single multiple wood clone. Madara can even use Hashirama Wood Dragon which Hashirama used battle with Madara. Mu summon the reincarnated Madara to the field and forcefully removing his coffin’s lid before voicing his assumption that Nagato had finally used the Outer Path(Samsara of Heavenly Life Technique) to bring him back from the dead, Mu corrects Madara, explaining that Summoning Impure World Reincarnation (Edo Tensei) had been used instead. Somewhat shocked by the manner of his revival, the two confront the Fourth Division. Madara asks who is responsible for the Impure World Reincarnation (Edo Tensei). However, as Mu(Tsuchikage) does not know, Kabuto takes full control and, speaking through him, identifies himself as Tobi’s assistant before informing Madara that he had been restored to an extent beyond even his prime. Madara begins his assault on the spectating Fourth Division, Gaara, Onoki(Tsuchikage) and Naruto’s shadow clone. 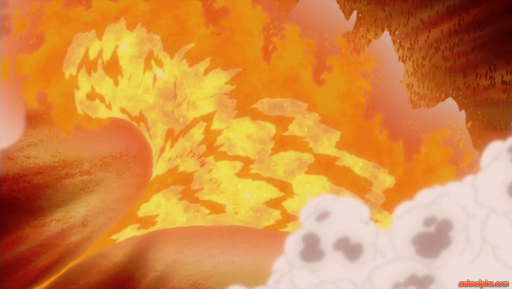 Madara uses the Fire Style Great Fire Annihilation technique, which takes the combined efforts of several shinobi to extinguish. Obscured by the resulting steam as he attacks them directly, he commandeers a sword and proceeds to tear through their ranks. 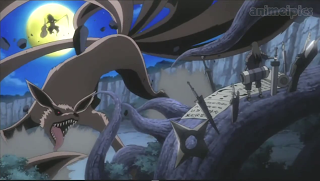 As Naruto attacks Madara from above while Onoki raises the ground below him, sending him on a collision course, Madara activates his Eternal Mangekyo Sharingan(an eye technique) and uses Susanoo to shield himself from harm. After Gaara (Kazekage) uses lightened sand to separate Madara from his protection and to pull him into the path of an oncoming Rasenshuriken, he activates his Rinnegan and uses the Preta Path’s ability to absorb the attack. When Kabuto tries to take credit for the improvements to Madara’s powers, Madara remarks that he shouldn’t get the wrong idea, as they weren’t his creation. Activating his Susanoo to protect himself, he is plunged even deeper into the molten liquid by A, before being completely immersed by another torrent of lava. 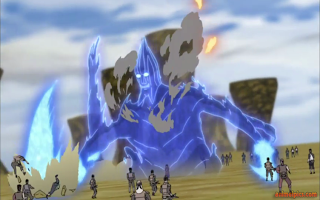 Emerging unharmed whilst sheltered by his Susanoo, Madara commends A and Mei’s respective offensive abilities, before deciding to assess the Kage’s defensive capabilities using Yasaka Magatama (A Technique). However, when his attack is blocked, Madara breaks through their dual-layered defense with his Susanoo’s blades, only for his vision to be obscured as the Kage launch another strategy. When Madara opens his Susanoo which he then uses to attack the Five Kage’s into the ground. Madara then uses his fire technique (Jutsu) Katon Kouka Messhitsu Jutsu which means Magnificent Fire Destruction Technique. Madara is literally on a roll right now, he doesn’t seem to be stopping as his doing great techniques after techniques.At this point Tsunade then notices that Hashirama Senju’s face has been joined with Madara’s left side. Kabuto explains that Danzou’s prototype is nowhere near Orochimaru’s technique. Kabuto then goes on to reveal that this was their Trump Card as the union between these two are on another level since Hashirama is even more powerful than Madara. At the ground where the 5 Kage’s fight. They are all getting beaten up by the clones which Madara Uchiha had created. Gaara tries to help the Mei as she’s getting beaten up, but as he tries to keep his guard up, the clones smash him from the top. He’s unable to defend. Mei Terumi (Mizukage) tells Gaara they’re too strong. Gaara (Kazekage) replies, at this rate they may die. Tsunade (Hokage) is going on an all out bashing match with the clones, Raikage tells her that she’s using up too much Chakra the way she’s going and that she should calm down.As the clones go for the attack, Onoki appears and uses a defensive jutsu to capture Raikage in the rock hand. 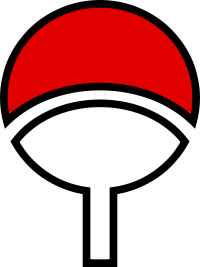 Onoki(Tsuchikage) releases the Mangekyou Sharingan. The Real Madara, watching from far away, notices that Onoki(Tsuchikage) is more powerful than first thought because he used a defensive weighted stone and even saved Raikage. With his Susanoo, Madara declared that he would destroy them and their efforts. But at the last second, as he attempted to deal the final blow, Madara’s Susanoo suddenly DE-materialized, much to his surprise. At that moment, Kabuto’s negation of Impure World Reincarnation (Edo Tensei) occurs as Madara finds a light enveloping him prior to making an attempt to kill Tsunade with a Fire Release technique. Madara’s soul then begins to leave its vessel just as Tsunade’s Strength of a Hundred Technique was cancelled, but suddenly re-encases in his body and Madara attacks her with his Susanoo sword, only for her to evade the technique (jutsu) while unconscious. After everyone else was sent back to the afterlife following the end of the Impure World Reincarnation (Edo Tensei), Madara still remained on the battlefield. 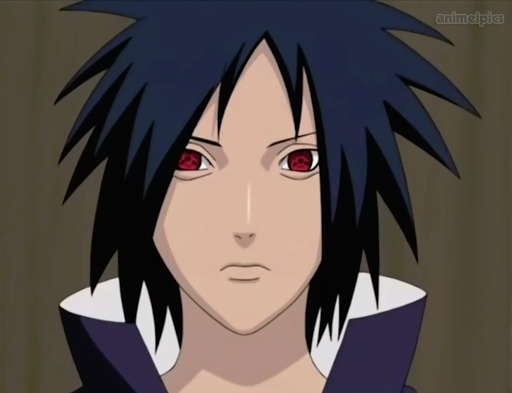 Madara explained that he negated the deactivation of the technique by severing the link between Kabuto and his own soul, by releasing the summoning contract of Impure World Reincarnation(Edo Tensei), stating that to be the technique’s one flaw. Stating that he is now bored with the Kage, and that using his final Susanoo on them again would be an insult to his power, Madara decides to make his way to Naruto to reclaim Kurama (Nine Tails). Though blocked from leaving by Onoki, Madara was still able to make his way to were the unmasked Tobi was, noting upon arrival, that the latter seemed to be having fun. 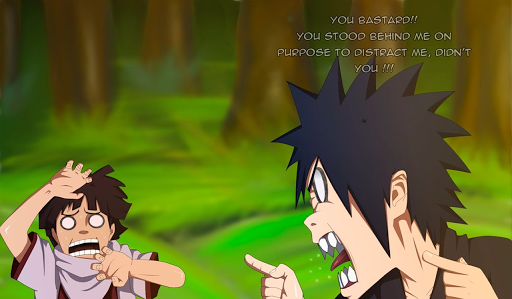 After Obito returned his gunbai, having revealed that the Kage weren’t left in good condition when Naruto asked what happened to them, and how Obito deviated from the original plan, Madara blocked the stakes Naruto threw at him and repels him with his Uchiha Return technique when Naruto attempted to attack him with a Super Mini-Tailed Beast Ball. He then told Obito to deal with Kakashi and Might Guy, while he dealt with the Hachibi (Eight Tails), and the Kurama (Nine-Tails), noting that it was not too late to seal them. Fighting between Naruto and Madara was continue to said that he was holding back because Naruto is a Jinchuriki but now he has no longer holding back. Uchiha Madara releases Hashirama’s Wood Dragon than Naruto gets pissed and says that he’s not going to hold back against a zombie because he’s already dead! Naruto’s Bijuu Mode faces Madara’s release of Hashirama’s Wood Dragon! They both go head to head, Naruto bites on the wood of the Wood Dragon, this hurts the dragon quite a lot. Madara then joined Obito, and the two jumped onto the Juubi’s (Ten Tails) head, where each were connected to the massive demon with tendrils which stemmed from the beast. 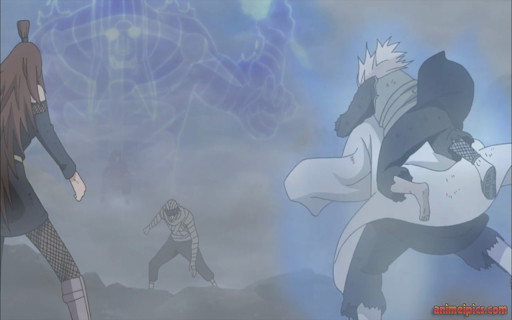 While Madara and Obito have a slight argument on how to handle the beast, as Obito wanted to cast the Infinite Tsukuyomi immediately, while Madara wanted to test the beast’s power. 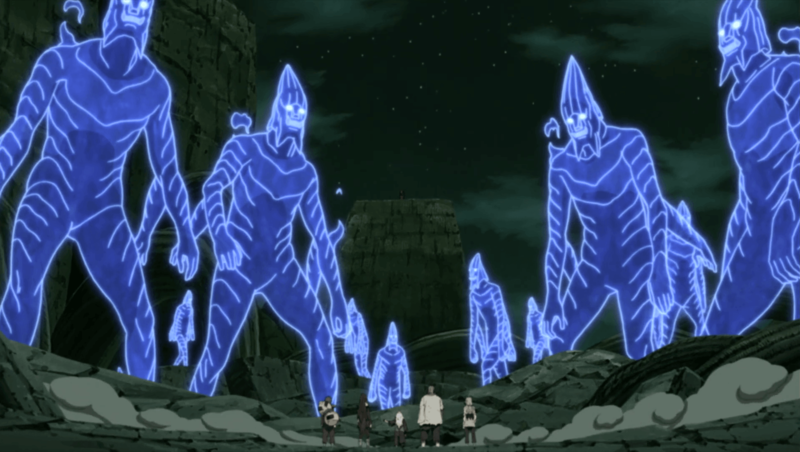 After the dust settles from a brief skirmish with the Eight and Juubi and due to having focused too much of their attention on controlling the beast, they are ambushed by the Hachibi (Eight Tails) who had been warped overhead the Juubi (Ten Tails). 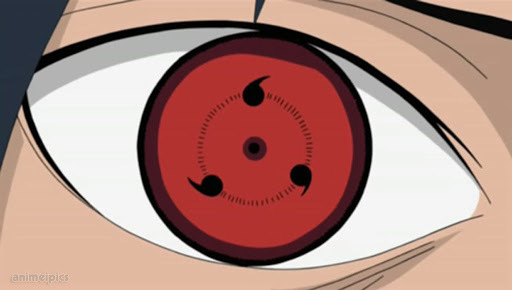 When their opposition’s battle strategy was launched and the two Uchiha were buffeted by the Storm Style Laser Circus technique, though Madara was prepared to deflect the attack, he soon realized it was not aimed at them but at the Juubi’s (Ten Tails) eye. Even when members of the Alliance bore down on them, Madara derided their effort while noting that the Ten-Tails would soon reach maturity. After Madara noticed that Obito was having trouble breaking Juubi (Ten Tails) free of the Shadow Imitation Technique, he decided to provide more power. However, the combined efforts of the Alliance foiled his counter-attack. After Obito goaded the Hyuga clan, the entire Allied ninja powered by Kurama’s chakra that Naruto gave to them simultaneously attacked Ten-Tails, shocking the Uchiha. 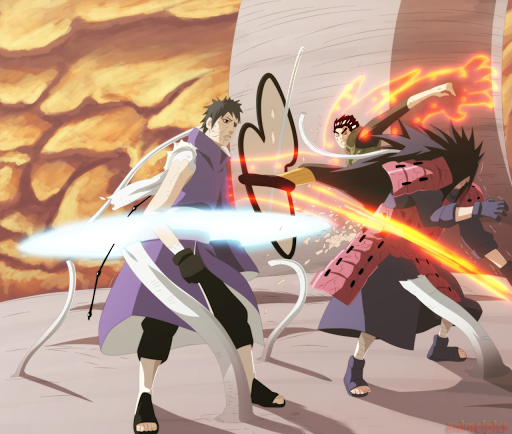 Obito and Madara’s connections to Juubi(Ten Tails) were then severed by Naruto and Rock Lee respectively with a Rasenshuriken and a well-placed kick. 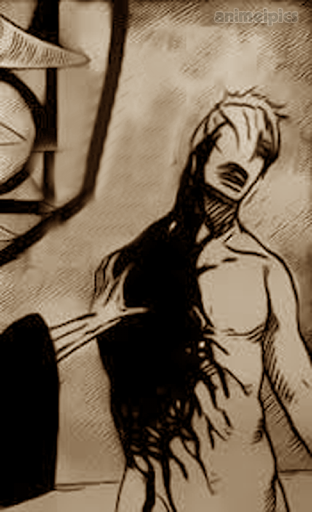 While his body was reconstructing itself, Madara was forced to retreat from atop the beast. Madara’s Kyuubi Susanoo final form is an enormous construct with its mouth obscured and a body similar to its full body form. The outer amour, which only remotely resembles the usual tengu with armor, and the trademark pillbox hat-like adornment on the forehead is split down the middle from the beak downwards where the normal Susanoo underneath is revealed. Along this armour, which seems much more fluid than the other known Susanoo’s, are holes at the end. In its stabilized form, the Susanoo dons an outer armor and a samurai outfit. It also has four arms, two plated ones which hold a pair of katana in sheaths, the other pair of which wields them. According to Madara, this Susanoo’s power is comparable with that of a tailed beast and he was able to repel and corner all five of the current Kage, while simultaneously demolishing a large portion of the mountain range behind them with a single sword swing. Madara displayed a unique use of Susanoo, shaping it as an armor to clad Kurama. With this the beast’s offensive abilities are increased tremendously as seen by the unique combination of the Tailed Beast Ball with blade of Madara’s Susanoo sword and how it could bisect six mountains with a single swipe. Sensing Obito’s come back to this present reality from fighting Kakashi in the other extent, liking to have turned into Ten-Tails’ jinchuriki in the wake of overcoming Hashirama, Madara esteems his disciple has outlasted his convenience and the time for him to reimburse for sparing him has come. 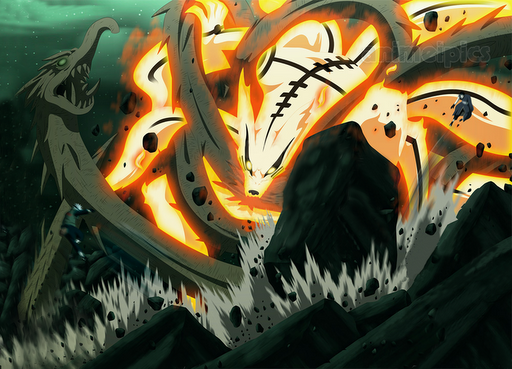 Structuring a seal, Madara brought on the dark poles installed in Obito’s physique to grow hence as he anticipates his will into Obito to compel him to execute the Samsara of Heavenly Life Technique to restore him to a living individual and start the fixing process on the Ten-Tails. 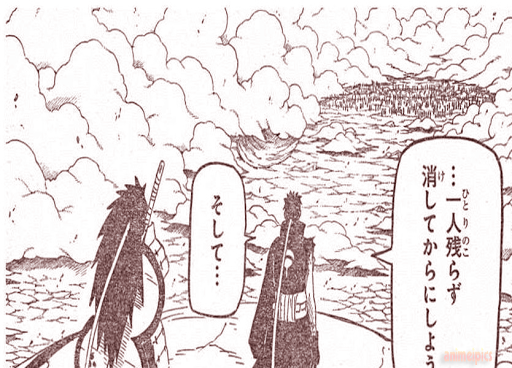 Be that as it may, Madara discovers that Obito is opposing him as he turns into the Ten-Tails’ have in his stead.